Luscious beaches, vibrant nightlife and famed dining are the primary attributes defining the beautiful city of Honolulu. 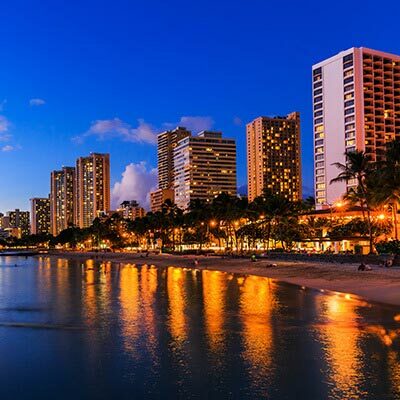 With Lookupfare you can easily find cheap flights to Honolulu. Just get an idea about the various flights deals to Honolulu and see how we can help you grab the best deal in flights. Also find some amazing offers on last minute flights. Honolulu is the capital and the most populous city of the state of Hawaii. The state capital is widely acknowledged as a major hub for military defense, international business and boasts of a diverse variety of east-west and pacific cuisine, traditions and culture. It is also counted as a major financial center of the islands and the Pacific Ocean. USS Arizona Memorial - The perfect site to complement your flight booking to Honolulu. Standing at 184-foot tall, this memorial site was built in the honor of 2,388 American heroes who sacrificed their lives in the Japanese attack on the Pearl Harbor. Battleship Missouri Memorial - This historic site gives you a vintage experience beginning with the "day of infamy" and sinking of the USS Arizona in Pearl Harbor and ending with unconditional surrender of the Imperial Japan aboard the USS Missouri in Tokyo Bay. National Memorial Cemetery of the Pacific - Dubbed as the "Cemetery of Heroes" this is the resting spot for over 25,000 victims of the three major American Wars - Vietnam War, Korean War and World War II. Shangri La - Built in 1930 as home to Doris Duke, this is a masterpiece of architecture showcasing some of the most spectacular collections of Islamic artwork. Makapuu Lighthouse Trail - This is amongst the most popular spots in the city. This easy route is moderately inclined to 647 feet summit. If you can manage a pre-sunrise hike to the top of the trail, you can catch some splendid views of sunrise. Find the best flights to Honolulu with Lookupfare and make your trip to "The Big Pineapple" a one to cherish for. With us one can also book cheap domestic flights and make your trip more remarkable within US.